“Adaptive learning is an educational method which uses computers as interactive teaching devices, and to orchestrate the allocation of human and mediated resources according to the unique needs of each learner.” Computers adapt the presentation of educational material according to learners’ learning needs, as indicated by their responses to questions, tasks, and experiences. Compared to corporate use, adaptive learning technologies spread over a far broader geography in the academic area. Although its company version is yet on its baby-step stage, as market awareness of adaptive tech has increased over time, people on business life have much more focus on this area, and companies providing successful adaptive platforms to schools begin to look into the business atmosphere as well. The potential of adaptive learning leads to many cross-border strategic alliances and mergers & acquisitions. Knewton pioneered adaptive-learning technology and raised more than $157 million in venture capital. In October 2016, IBM and Pearson announced a partnership to make IBM Watson Education’s cognitive capabilities available to millions of college students and professors. McGraw-Hill Education has built its own adaptive platform, LearnSmart, through its acquisition of Area9. Area9 also provides services to corporate learning. Smart Sparrow, a Sydney-founded company, now based in San Francisco, has signed with 150 universities, along with another 50 businesses and organizations. To date, the Company has raised nearly $16 million in venture funding. Its adaptive learning platform adapts through modules and offers interactive quizzes and simulations. IBM Research cooperated with Skillsoft in completing an adaptive learning pilot program with 32,000 users and provided adaptive data over user-content interactions, content relationships, and consumption patterns. Axonify Inc., Cerega Global, and CogBooks are other platform providers for corporations. Experts argue that Programmed Instruction methods have not lived up to expectations. Skinner and his friends, unfortunately, lack the technological offerings of today. Adaptive learning solutions require the help of Big Data. As highlighted by Gary King, the Weatherhead University Professor at Harvard University, “The big data revolution is that now we can do something with the data.” Today, information technology is capable of managing and processing data beyond the human scale. MIT Sloan’s Professor Erik Brynjolfsson said that the ‘Big Data’ revolution is occurring mainly because technology enables firms to gather extremely detailed information from, and propagate knowledge to, their consumers, suppliers, alliance partners, and competitors. Besides, progress in psychological science and generational evolution caused a shift in learning which made adaptive learning applicable. New generations are digital natives and learning through computers isn’t something challenging for them. Adaptive learning methodology has already begun to play a crucial role in the teaching process of higher educations, and it’s entirely natural to question whether it’s a good match to help companies overcome the inefficiency in their employee development company policies, and improve learning outcomes. Adaptive systems give the learner right content with a right level of difficulty to optimize the learning ability. 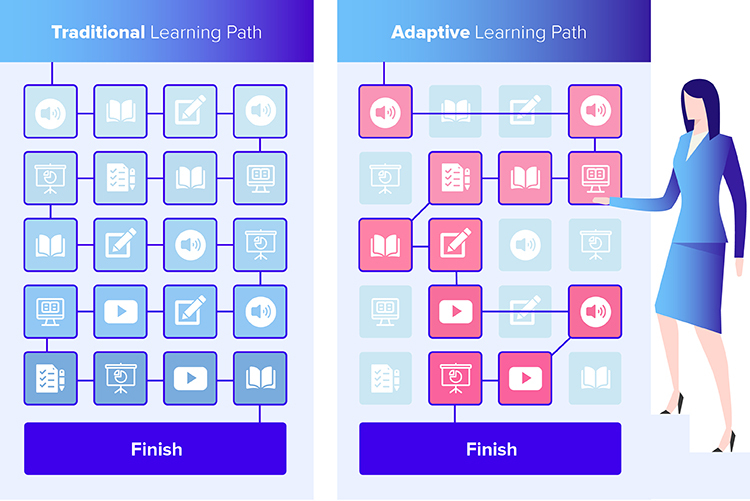 By using sophisticated algorithms to determine learner proficiency based on assessments, adaptive learning platforms set the correct level of difficulty and save the learner from a chunk of useless information downloading to the memory. Don’t lose time, just take what you need. Scheduling: Employees can set the time to get the course whenever they want, even on their vacation if they want to. Time-saving: It focuses on what a user lack information and tries to fill the gap. Therefore, you don’t have to waste your valuable time on learning what you already know. Quick changes: The method enables you to reprogram the content. So, pieces of training can be "re-designed" quickly based on new policies, job titles, products, corporate objectives, and so on. Today’s workforce is highly diversified, actually higher than ever. “Because people are living longer and staying in the workforce longer, this is the first time in history that four generations are likely to find themselves looking at each other over the same conference table.” says Lynne C. Lancasteri, the co-author of “When Generations Collide.” Managing a multi-generational workplace is one of the most significant challenges that today’s leaders have to face. It’s undoubtedly true that generational differences are real and should be taken into consideration delicately. Today’s workforce is blended with four generations, and offering the same training to each generation wouldn’t give us the most effective learning outcomes. The adaptive approach considers the fact that each generation may have its own specific needs in learning, given the different job descriptions, current knowledge levels shaped by changing background experiences, variable requirements and preferences. Since it is adaptive and flexible, while providing data, it offers the right way of learning for the right type of learner. Adaptive learning targets to have direct impacts on employee productivity through its characteristics mentioned above. However, it has also an indirect benefit on behalf of companies that are spending millions of dollars on their retention policies which should be under no condition deprioritized. Based on a recent report on employee engagement by Bersin&Associates, U.S. companies invest approximately $720 million per year to have engaged employees, and that is only half of the expected $1.53 billion that the companies will spend eventually. Moreover, a study by Guy Berger, working as an economist for LinkedIn, underlines that young generation tends to change jobs more than older age and this will not be slowing-down in future. The study uncovered that the average number of companies that each generation worked for within five years after graduating has increased steadily over time. Today, new graduates will likely change their jobs three times in this period, which means job-hopping is a battle that all employers face. So, how can we make it stop, or slow down at least this workforce erosion by a cheaper way? The answer relies on providing a well-designed training program. Employees prefer to change jobs unless they find a way to develop new skills to ever-changing catch-up work lives in today’s highly competitive landscape. They wouldn’t want to anchor in a company that makes them run around in circles. Another survey, from Sweden, also supports this outcome: “Within the first five years when a new generation comes to work, they are inclined to place less importance on money than learning.” That is to say; if you provide a better training program, you can keep new graduates longer. A study by Gallup shows investing in and focusing on employees' talents boosts employee engagement. Such investments require personalized approaches, not standard training programs. Understanding today’s workforce requires seeing things in the broader perspective. Leaders’ role here consists of helping employees in their self-improvement paths, and the best way around is to give them well-designed individualized training programs. However, many companies -especially the big ones- struggle to build a “digital learning” experience in their established structure. 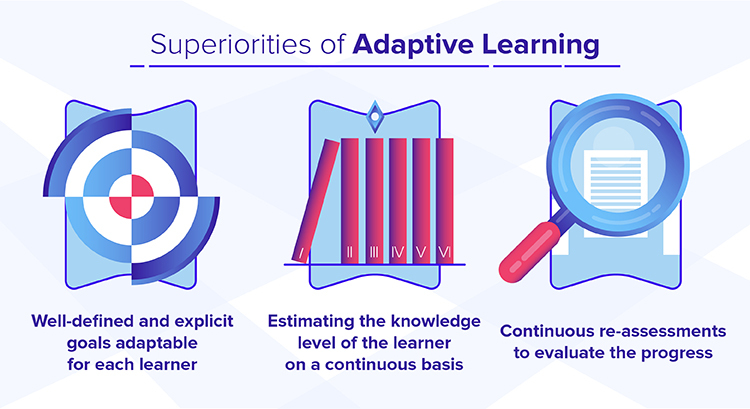 Besides, there are some skeptic views against adaptive learning as well -"concerns of overuse of adaptive tools—which usually involves learners’ attention focused on device screens—detracts from the social aspects of learning." A speed-reading company is using the adaptive approach in its learning technology. Worked in collaboration with B.F. Skinner in developing “Programmed Learning Theory,” Prof. R. O. Turkkan later founded a speed-reading company and applied an adaptive assessment successfully in the company’s learning software. To strengthening eye muscles, trainees are asked to work on two multi-focus exercises. They are supposed to look at the screen and try to capture the word which is continuously changing its place over the screen. Since the words change their positions each time they appear on the screen, eyes have to move from one side to the other, and eye-muscles get stronger through the exercises. The adaptive variable here is the words’ display speed which is continuously being adjusted depending on the accurate shots by the trainees. Hence, trainee-specific progress can be realized, and eye-muscles can go stronger based on each trainee’s capacity. Trainees can make incremental progress based on their own potential and make fewer mistakes in time. Personalization is everywhere in our daily technological lives. Facebook advise you who to be friends with based on your friends. Netflix reads your preferences based on what you’ve watched. Amazon tells you what to read based on what you've bought before. So why not we use it for reading employees right-to-do-point learning needs?